Milwaukee Public Museum Director Samuel Barrett with Simba on the roof of the then museum-library shared building. WUWM's Maayan Silver reports on Sim the lion cub who lived in the then library-museum shared building. In the file of "truth is stranger than fiction," the Milwaukee downtown library was once home to a lion cub. While it seems fantastical, he lived there back when the library shared a building with the Milwaukee Public Museum. And Heidi Havens heard about the big cat while working as a librarian elsewhere in the city. So, she wrote to Bubbler Talk — our series that answers your questions about Milwaukee’s people, places and culture — asking us to find out what happened to him. The story starts in 1928, with an expedition of museum officials and local leaders to East Africa. They went to develop an understanding of the region and collect cultural specimens. One of the “specimens” they came across was a lion cub, brought to them by local Maasai people in the region that is now Tanzania. “He had been found in a brush fire and had been rescued, while his parents had been killed. He was nursed by local nanny goat until people came to feed him through bottle and meat,” says Librarian Maria Burke. The Maasai sold the singed lion to the expedition for 2 shillings — the equivalence to $7.16 today. They called him Sim, short for Simba. When Sim was purchased, Librarian Dan Lee says the lion was no larger than a housecat — just with bigger teeth. “But he was more like a baby, he would gum, he wouldn’t bite or chew on people,” Dan says. The expedition crew grew attached and brought Sim by ship to Milwaukee. He arrived at the Library and Museum Building 90 years ago, on Saturday, April 13, 1929. He was available for view by the public for a few days, from April 14-16, 1929. He was viewed by thousands, was petted by dozens, and playfully bit the elbows of at least three people. But having so many humans around freaked him out, so after that, he was removed from the public's view. Sim used to live in the taxidermy room, which still exists today — with “Taxidermy” still on the door that led to the room. He moved into the taxidermy studio on the fourth floor. 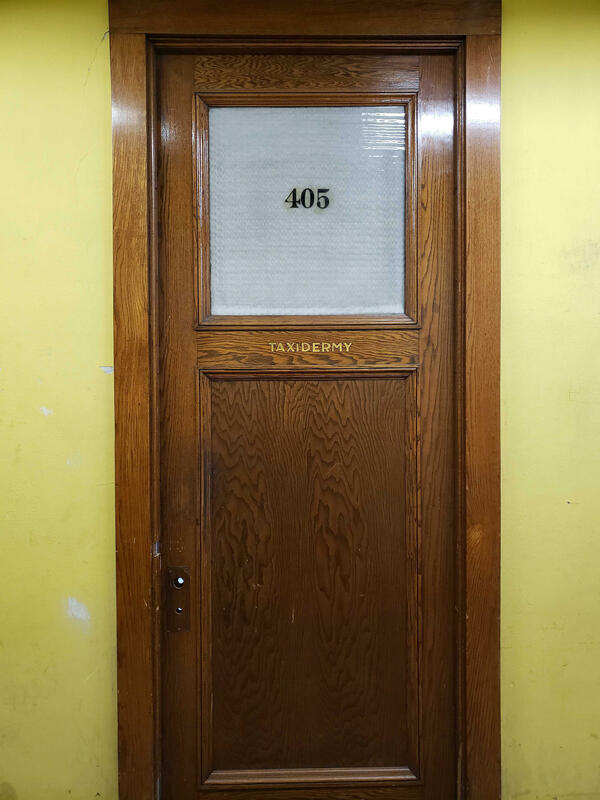 The room is still there, with the old-school lettering "Taxidermy" still printed on the door. It’s now a graveyard for card catalogs. No lions to be seen — not even the Milwaukee lion of 2015. But right outside of it is a very long wooden hallway. “This is how Sim got his exercise. One museum worker would be stationed at one end, and another would be stationed at the opposite end, and they would just roll the [wooden bowling] ball back and forth and Sim would chase after it,” Dan says. It was basically bowling ball fetch with a lion. And, as you might imagine, it was really distracting for the taxidermists to have a lion around during office hours. So, they kept him in a lion house on the roof while they were working. 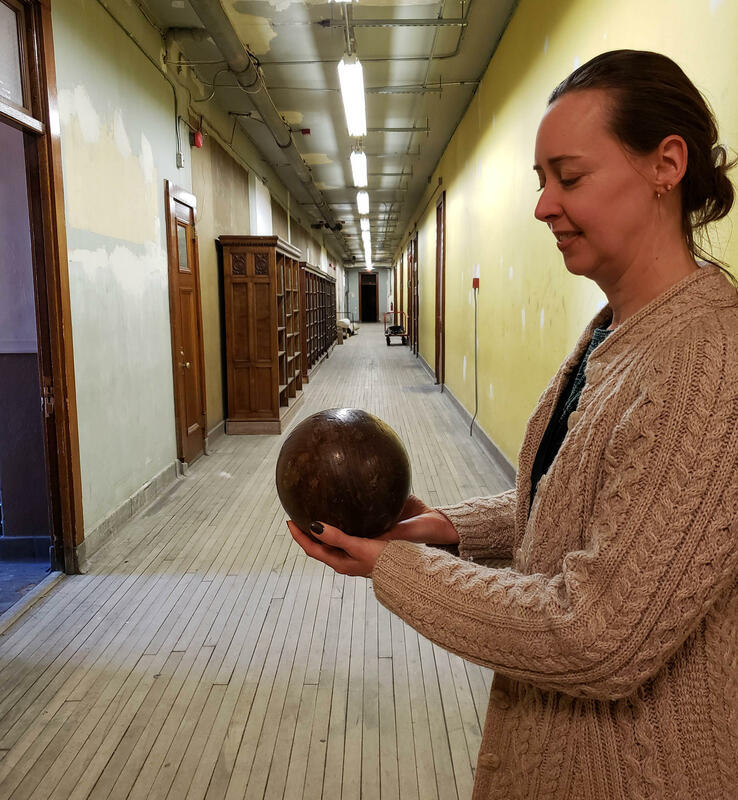 Librarian Maria Burke displays a replica wooden bowling ball in the hallway where taxidermists used to play fetch with Sim the Lion. But the wooden bowling ball prematurely cut short Sim’s stay in the building. He developed tooth problems from chewing on the ball, leading to emergency dental care at the Washington Park Zoo — and that’s where he spent the rest of his days. “Because he was so habituated to people, he was an animal that the keepers could go in with. We do have photos of his keeper Bill Ehr with him as a full-grown adult lion, standing there with Sim without any barriers between them,” says Mary Kazmierczak, the librarian at the Milwaukee County Zoo. Sim died in 1943 at the ripe old lion age of 14. But the story doesn’t end there. 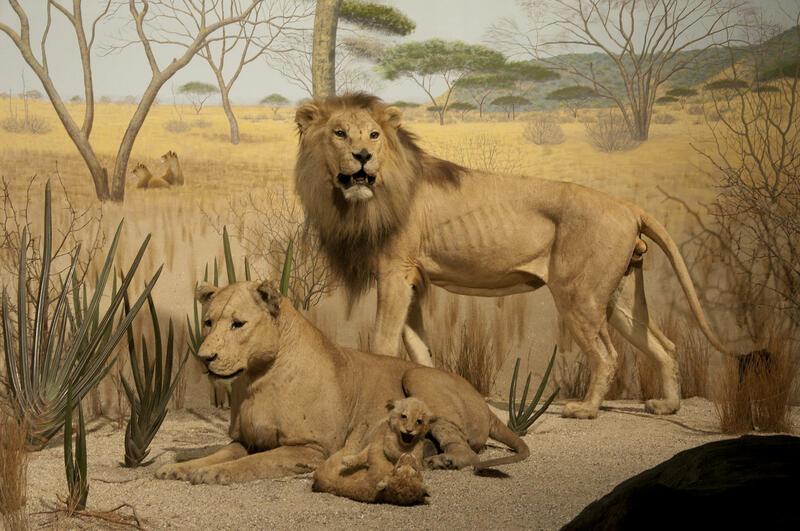 Inside the Milwaukee Public Museum’s African diorama, a full-grown male lion stands at attention, captivated by something in the distance — maybe the steady flow of public museum patrons. It’s kind of eerie, actually. Full grown Sim[ba] was stuffed and mounted by taxidermist Walter Peltzer in 1951. He's now on display behind a female lioness and two cubs in the African savanna diorama at the Milwaukee Public Museum. Now that’s not just any lion. That’s Sim, in his full taxidermied glory. It’s quite the full circle — or, the circle of life, as they sang in another famous story about a lion named Simba. What does question-asker Heidi think about this lion’s life cycle? Other lions? They've gone on to different infamy. The practice of designating green space, especially for dogs to romp freely, have become more and more popular. But one dog park in Milwaukee's Riverwest neighborhood has some questioning the safety of the ground where their dogs frolic. What's under the grass at the Roverwest dog park in Riverwest? Some say it was a poisonous dumping ground. Are our dogs safe there?